This is still happening intermittently for me. I remember the dial up days where EVERYTHING was slow. Now we expect instantaneous, I think. But it'll be nice to be back to fast enough that I don't drum my fingers while I wait. LOL--Mel, I'm still on dial up (you know--the Luddite) and am used to stuff being slow but what has been happening a lot to me is that the system often can not find the preceeding page and I have to start over and the other thing that happens is that it tell me I can't post within so many seconds of the preceeding post--when the preceeding post didn't post at all--if I insist onj clicking on that message it will then, reluctantly, post the message. But as a Luddite I hardly know what fast is unless I'm at the library--their computers are FAST! We're still tracking this at the moment. Very sorry about this. Just to clarify, do you notice if the site speed gets slower and slower but eventually picks back up? We see this pattern with other sites. Mine seems just intermittent...I'm not sure if I'm on the site long enough to tell. Sometimes it'll just be a long load time, other times normal. I use both Firefox and Chrome, and it happens on both. The Doberman Forum : Doberman Breed Dog Forums database has encountered a problem. 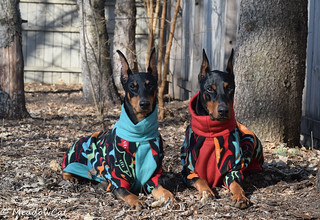 Open the www.dobermantalk.com home page, then try to open another page. The www.dobermantalk.com forum technical staff have been notified of the error, though you may contact them if the problem persists. We've been getting a lot of duplicate postings here. I'm thinking that's because the system is so slow people are clicking twice thinking the first didn't go through, and then they both show up? Though if I end up double posting before the first post is displayed, I get a message saying that my 2nd post is a duplicate and I'm kicked over to the original post, so that part is apparently still working sometimes. No. My double postings have come immediately. Basically I post. Then, get a notice saying that I need to wait x amount of time to post again. And then the post either appears as a single or a double. No rhyme or reason. Edit to say: Mel... bug just had a double post on the chicken thread. It was several minutes between posts. Methinks VerticalScope needs to hire some better software trouble shooters. Last edited by 4x4bike ped; 03-12-2019 at 01:49 PM. Mel and John--that double post was one where it wouldn't post anything and I tried again and it was very slow but posted that time--HOWEVER after I went an to other threads it evidently posted that original post AGAIN. How has it been so far today, and last night? Any more speed issues and double postings? Any specific Database errors you're seeing? The double postings could be explained by multiple clicks of the submit button but we'll have to see if this is a larger issue. Mine is particularly slow this AM. I notice after I post that it doesn't appear for such a long time after that it doesn't seem applicable to the topic anymore. weird. We took the site down yesterday for a short time to upgrade the servers, do some maintenance ect, which should have resolved some of the speed/DB issues. Have you been having any problems this morning? Glad to hear. Do let us know if you see any more slowdowns or DB error messages from before. It looks like we're cruising along now. Faster and no unintended double posts. When you say "long reply", how long have you been on the page writing your post? Well this morning has been an exercise in frustration. 2) I was one the Chicken thread and clicked on a Quote button and instead of getting the next screen I expected I was on the Politics thread--that was way too bizarre for me--had to go back and start over. 3) Just now I sent a reply to the thread I'd been on and got a message that said there was a data base error and suggested I try the same things that ECIN listed on his reply post #42 on this thread. I've gotten several data base error messages in the last few days. I took my computer in for a tune up last week, just in case it might be me. I haven't been on much since I got it back, so if it continues, I'll let you know. But, what a pain, with the tune up it erased all my passwords to everywhere. 1) How long are you waiting between posts? 2)When you clicked "quote" it just brought you to the politics section or the quote you were making was posting to the politics section? 3) When you refreshed the page did the error clear or was it a continues error? Um I'm not sure I understand this question. When I post something I wait until the new post shows up. Sometimes it takes so long I just give up. That's exactly what happened--and boy was that a shock I was in the Chicken thread--and when I clicked on Quote to reply to one of the Chicken thread posts what came up was a thread--I said "What the...? and looked at a couple of posts finally realized that none of the posts were from the chicken thread and went looking to see what thread they were in--turned out to be the Politics thread--which I have avoided like the plague. As far as I could tell there was absolutely no reason why I should have found myself on the Politics thread. The error did not clear--actually that was when the data base error showed up. Then I couldn't refresh the page. I finally had to shut Dobermantalk Forums down and start again. Thanks for checking on it.